"Following the acclaimed release of Mickey Newbury's 'An American Trilogy' box set in 2011, Mountain Retreat, the label Newbury founded in 1995 to self-release his music, is now set to release three long out-of-print Mickey Newbury albums: Lulled by the Moonlight, Stories from the Silver Moon Café and Blue To This Day. Each new edition of these three Mountain Retreat releases is housed in a digisleeve, sports stunning cover art and includes full lyric booklets. Blue To This Day also features written tributes to Mickey Newbury by his friends and colleagues. The 2011 An American Trilogy box set introduced Mickey Newbury to a new generation of musicians and music lovers while reminding older fans of his exquisite artistry. It was Mojo's reissue of the year and garnered a slew of five star reviews from as far afield as The Sun, Telegraph, Mail on Sunday, Uncut and Record Collector. The Wire commented that: "Newbury is able to illuminate mundane moments of private sorrow and make them epic." These new editions are particularly welcome as they were never released in the UK and are a true measure of Mickey Newbury's consistency; he was a man whose music enriched folk, country and pop music across an extraordinary body of work recorded between 1968 and his final recordings in 2002. Earlier this year, Bill Callaghan released a special 7 inch version of Mickey Newbury's "Heaven Help the Child", coupled with Newbury's original. "There's something psychedelic and transcendent about Newbury's best work," observed Callaghan which is capable of "imparting a truly epic knowledge and vision." Mickey Newbury's contemporaries always held him in the greatest of awe. John Prine once described him as "probably the best songwriter ever." Tom Russell called him "the master of the middle tempo ballad", and Steve Young noted that he was such "a great and soulful writer". Willie Nelson, Johnny Cash and Waylon Jennings regularly sung his praises while another of his closest friends, Kris Kristofferson, once said that: "I learned more about songwriting from Mickey than I did any other single human being." 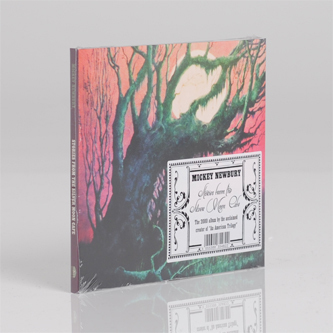 Lulled By The Moonlight - First released in 1996 as a limited edition CD and only available through Newbury's official website, Lulled by the Moonlight was Newbury's first album of new material since 1981's Mercury label release, After All These Years. Although he had distanced himself from the music industry, Newbury could still draw from the cream of Nashville session musicians every time he recorded. The likes of Roger Hawkins, Gene Chrisman, guitarists Reggie Young, Mike Elliot and Jack Williams (who also played live with Newbury), all appear on Lulled by the Moonlight. Conceived as a tribute to Mickey Newbury's songwriting hero, Stephen Foster, the title is taken from a line in Foster's "Beautiful Dreamer" and opens with "Three Bells for Stephen", a tribute to him in song. This serves as the springboard for a suite of songs dealing with memory, loss and mortality, given the added poignancy that Newbury had been diagnosed with chronic lung disease prior to making the record. Despite his illness, he continued to record and tour right up until his death in 2002. The songs on the album are linked in Newbury's unique style by atmospheric interludes that hark back to the classic run of albums he recorded between 1969 and 1981. Stories from the Silver Moon Café, originally released in 2000, was the second album of original songs issued by Mountain Retreat. Also very much in Newbury's in characteristic, understated, sensitive style and recorded with the same Nashville players, alongside twelve previously-unreleased Newbury originals, the album features a new recording of Newbury's classic "Why You Been Gone So Long". The song originally appeared on 1973's Heaven Help The Child and has been covered by Jerry Lee Lewis, Jessi Colter and David Allan Coe, among others. Of the new songs, Susan Newbury, Mickey's wife for over forty years, considers "A Storm Is Comin'" to be one of his finest: "the song he wrote when he realised he was dying." Blue To The Day was the final Mickey Newbury recorded prior to his death in 2002 and was released posthumously on Mountain Retreat the following year. The album is a moving testament to the unique talent of one of America's greatest singers and most gifted songwriters and was a remarkable achievement given the state of his health when it was recorded. Newbury often had an oxygen tanks on hand during the sessions but his voice was as uplifting as ever. Notable accompaniment came once again from some of the best Nashville session players including Mac Gayden and Kenny Malone who played on the series of albums recorded at Wayne Moss' Cinderella Sound studios that commenced with Looks Like Rain. Among the highlights of Blue To this Day is a staggering re-interpretation of Leadbelly's "Bring Me A Little Water, Sylvie" and a new version of "Remember the Good" from Newbury's 1971 debut album for Elektra, Frisco Mabel Joy."